Coordinating Committee to Help Form Workers’ Organizations: Preparations for Another Capitalist Attack Embedded in Social Security Organizations’ Amendment Plan! Recent remarks by Saeed Mortezavi, the general director of Social Security Organizations (SSO), and news published in the media and news sites indicate that this [aforementioned] organization intends to bring changes to Social Security law based on age and background record with regard to retirement from normal as well as difficult and hazardous jobs, increases in workers’ share of premiums for their retirement pension, limiting insurance liabilities, and limiting the free health insurance provided by the Social Security Organization. This organization [SSO], which has prepared a draft to amend some articles of the Social Security Law, intends to increase the retirement age by several years (probably 5), and also increase the share of the retirement premium paid by the workers from the current 7 percent to 9 percent. The detailed contents of other articles in this draft are unknown; discussions about it as usual have taken place behind closed doors. What is clear is the fact that its changes are aimed at the already arduous situation of the working class, and intend to make it even direr. Naturally, it is the duty of labour organisations and independent labour activists to prevent the adoption of such an outrageous set of laws with broad and unified protests by all possible means. 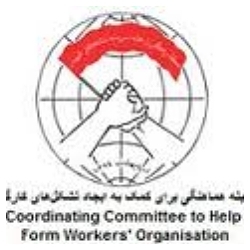 The Iranian labour movement, during the recent discourse on amendments to the labour law, was at least for the time able to stop the adoption of these reactionary modifications by timely and appropriate protest actions. Now it is also incumbent on the labour movement to make its independent and decisive voice heard by organizing protest actions in the workplace and residential quarters by any possible and appropriate ways against the capitalists who have aimed at the working class’s living condition and, once again, by the power of the working class, force them to retreat. The Coordinating Committees condemn this action by the Social Security bosses, which sacrifices the interests of the workers in favor of those of the capitalists, and declares that this organization [SSO] and all of its wealth and property are the outputs of workers’ labour. It is therefore only workers who have the right to decide the composition of its laws – a right that has been taken from the workers through preventing workers from forming their own independent organizations. Now is the time for all labour organizations, all labour activists, and all labour groups and circles to stand against this offensive by all possible means and defend their undeniable rights in unity.